The basic working priciple of this envelope module is the same as ENV1 and ENV2. The big difference is that this envelope can be delayed and that it only uses an AR curve. 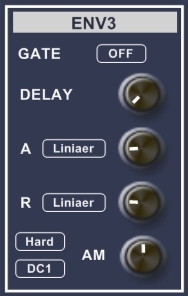 If you select this module at the AM terminal of an LFO you can delay the output signal of this LFO by the time set with the DELAY knob. After the delay the LFO signal wil increase in amplitude according the set Attack curve and decrease in amplitude after the envelope is released according the Release curve.